But more importantly, Mouchette is preserved “alive” and constantly growing. Mouchette is “preserved” when the website is active, receives contributions, is moderated and repaired to maintain all its interactions. -Each work has their own database manager with a custom interface, each made at different periods. -They are used to moderate or edit the contents of the posts and publish them, or not. -Yet they have no info system, I am the only one who knows what the interface does. 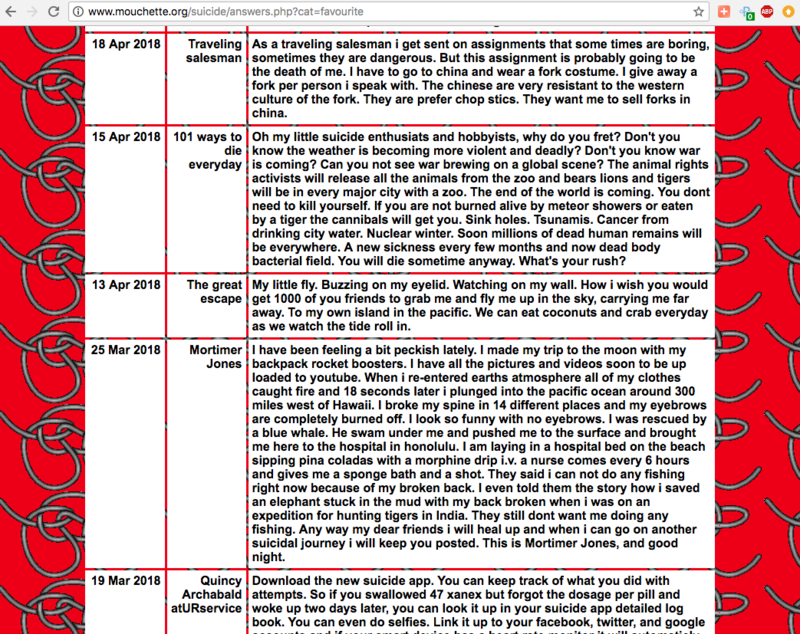 -The emails sent to the users were a part of the narrative into which the user has posted. They notified of the publishing and continued the story. -The system is totally outdated (and not complying with the new rules), yet still in use. 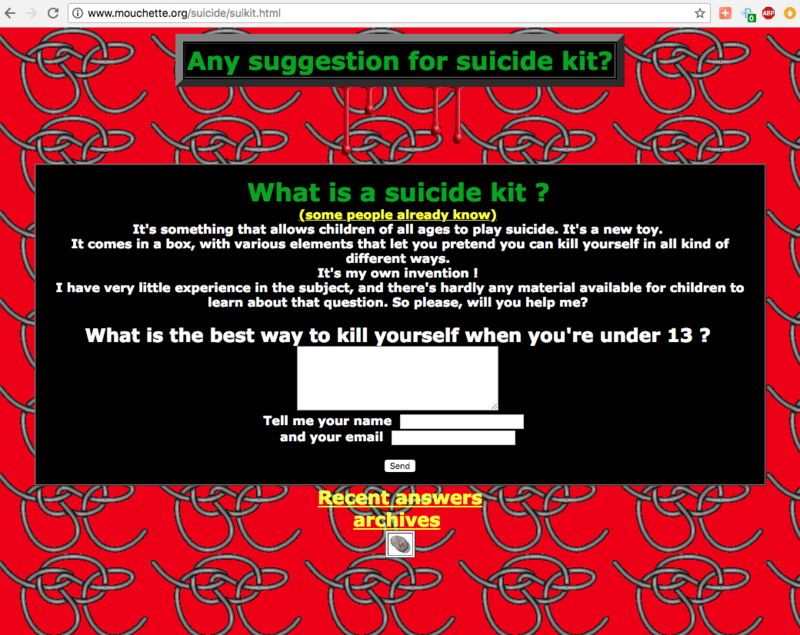 Here in Suicide Kit: a narrative scenario “What is the best way to kill yourself when you are under 13”? 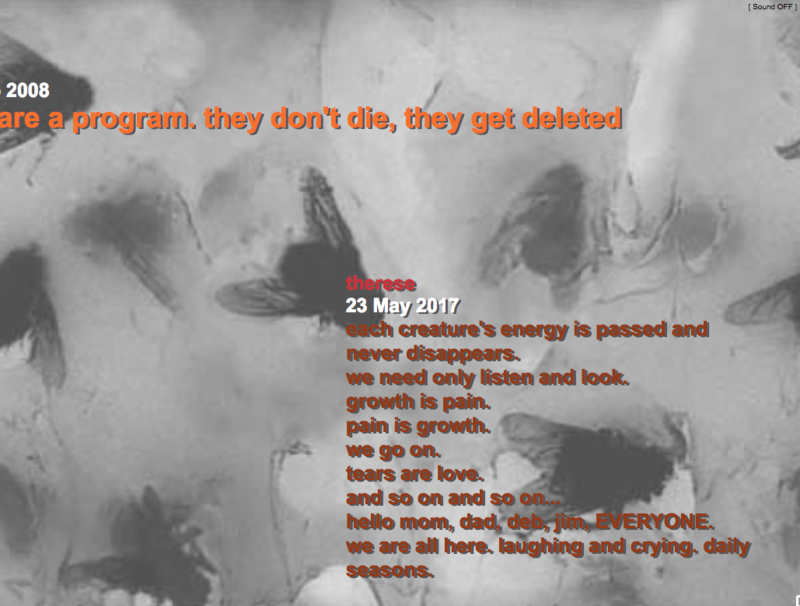 Here the posts are being republished online, every week more or less, there is a moderation, it’s manual. Answers are being classified: here the category “cruel jokes”. You can circulate the categories through the links at the top of the page. More “gifts” to the fan club stored in the site. 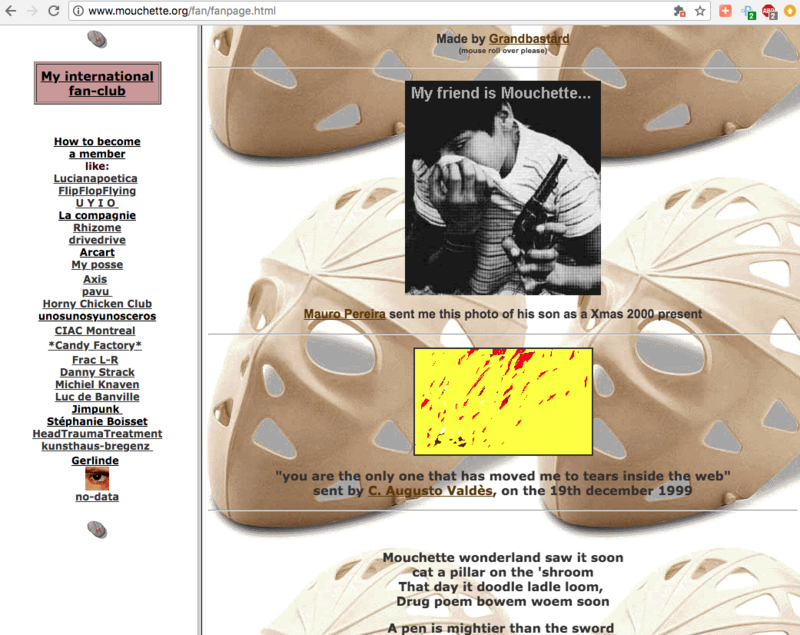 Outside the domain name, there is a lot of webpages of information concerning mouchette and it is worthy of preservation, whether it was made by me, or others, or just found online. Entering the world of mouchette.org for me is like entering the alternate reality of my early teenage self. 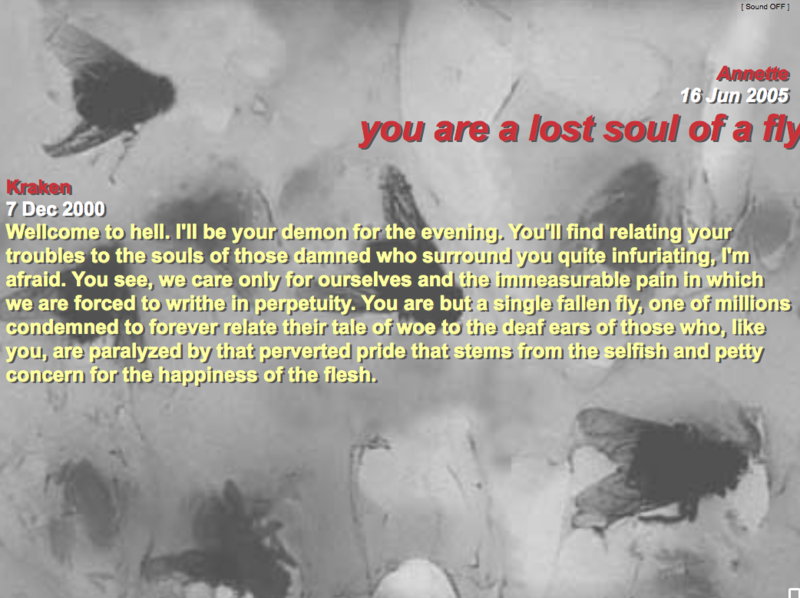 “Cue obsession with kitsch, suicide, and pretty/deranged pictures. Mouchette’s genius lies in an interactive and unexpected experience created by an anonymous figure (human? Cyborg? Man? Woman? Child? Adult?) that doesn’t supply all of the answers. I believe this is a piece of net art because, really, what else would it be? 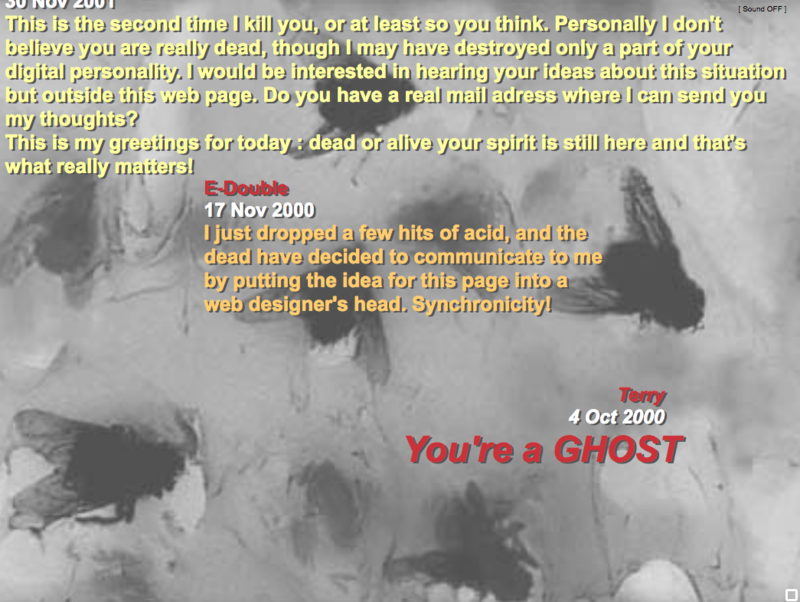 It’s a mash-up of cut and paste, interactivity, mystique and originality. Mouchette embodies the new media artist as a prankster, whether that be luring viewers into releasing person information or leaving out enough information to keep us engaged and fascinated. 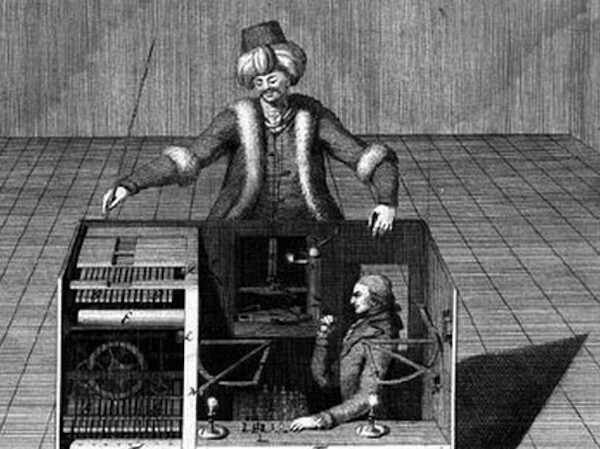 My plea here is to remove the blind spot that hides the human worker(s) behind my website, behind every website. Institutions continue to ignore why they are seeing art online: who puts it there, who keeps it there. This is the first condition to get involved in the preservation of net art: to retrace the presence of all the human workers, their commitment, their expertise, their authority. 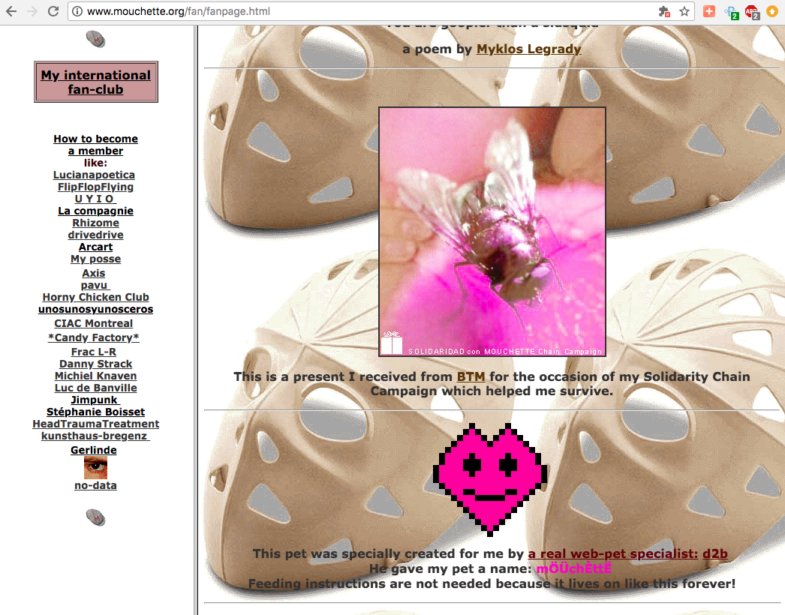 To preserve Mouchette.org the way I think it should be done is to transmit my practice to someone else, one or more people who can run the site in a similar way, which can also be a personal way, but a way that keeps the spirit. Similarly to eastern practices of preservation when you don’t preserve the objects or the monuments, but you transmit the craft, the talents, and the experience in order re-build the monument or the object when necessary.